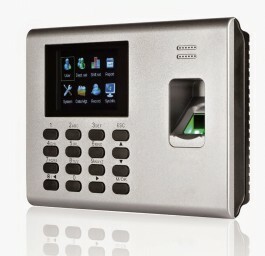 Highly compact and functional LAN based, biometric terminal for access control and time attendance with free software and integrated battery, making the product very comfortable for use. The device offers incomparable productivity and upgraded reliability algorithm in combination with excellent speed and precision for fingerprint checking. The product also complies with the protection of the personal data. Biometric terminal K40 is easy for installation and comfortable for use. It’s suitable for a variety of sites, which needs to control the attendance of the employees by their biometric data and the visitors through the integrated RFID reader. It’s small size and the integrated battery with ability to work for five hours without power allows the device to be used as a mobile system for construction and other sites, which lacks power supply and connectivity. K40 is a terminal for control of time attendance with different methods for identification including fingerprint, contactless RFID card and PIN code. The recognition takes up to 2 seconds, which makes the product highly suitable for places with heavy flow of people. K40 has the ability to account time attendance by beginning and end of the workday. Device’s LAN communication in contact with the software allows unlimited extension and the ability to create centralized system for monitoring of distant objects. Nevertheless presence of relay output enables you to control a locking or other type of mechanism like barrier, elevator, alarm system, illumination etc. The free software for time attendance supports many functions and settings, which helps for precise control and facilitate the work of the operator. It supports the opportunity to create different types of work shifts, preliminary schedules, automatic setting of work shifts, input of vacations, absences, secondments and the ability to export the reports.